The United States and Mexico have apprehended nearly 1 million Salvadoran, Guatemalan, and Honduran migrants since 2010, deporting more than 800,000 of them, including more than 40,000 children. While the United States led in pace and number of apprehensions of Central Americans in 2010-2014, Mexico pulled ahead in 2015. Amid increasingly muscular enforcement by Mexico, U.S. apprehensions of Central Americans for fiscal 2015 to date have fallen by more than half compared to the prior year. Many of those who previously would have made it to the U.S. border and been apprehended by the Border Patrol now are being intercepted by Mexican authorities. The findings suggest that the increased Mexican enforcement capacity is reshaping regional dynamics and perhaps ushering in changes to long-lasting trends in regional apprehensions. 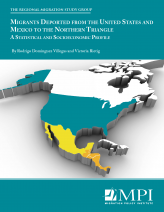 To achieve a more comprehensive policy that goes beyond just shifting the flows, the report recommends that the United States and Mexico, working with Central America, design migration policies with workable enforcement and humanitarian protection as well as development policies that address poor standards of living, improve citizen security in the Northern Triangle, and facilitate the reintegration of deportees. The report also offers a demographic, socioecomic, and criminal profile of Central American deportees, finding that the majority are young males with low educational attainment levels, most having experience in low-skilled jobs, but with nearly 40 percent reporting they were unemployed in the 30 days before setting off on their journey. Among children under age 18 who were deported, the majority are boys between ages 12 and 17. However, the surge in overall child inflows since 2013 has also been marked by a sharp increase in the number and proportion of migrants coming from the most vulnerable groups: children under the age of 12 and girls.